In Paris, Texas even Jesus wears cowboy boots. 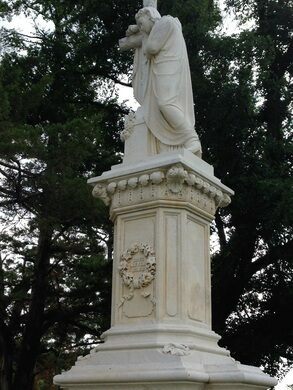 Out of the 40,000 graves in Evergreen Cemetery, Willet Babcock has just about the tallest memorial. The fifteen-foot height, while certainly impressive, isn’t the most surprising thing about the marker – that would be the cowboy boots. A starship has landed in Texas, a welcome break for weary travelers from a drab stretch of I-35. Babcock wasn’t from Texas. He served as a lieutenant in the Civil War, but being from Ithaca, New York he was on the Union side. A furniture and casket maker by trade, Babcock ended up in Paris, Texas where his factory and downtown store put him squarely in the center of respected Parisians. He was known as a man with a sense of humor, fun and entertainment. His furniture store doubled as the town Opera House, complete with a 1200-seat theater on the second floor. Before he died, in 1881, he ordered himself an impressive memorial from a master-stonecutter, a German immigrant named Gustave Klein, who carved some of the more ornate markers at Evergreen. Along with some typical memorial elements – carved wreaths, a cross, an angelic figure in robes – Babcock gave his final presentation to the world a little Texas twang. The Jesus like figure is sporting cowboy boots. There is debate about whether it really is Jesus. Some say the face is too feminine (there is no beard) and he (she?) appears to be leaning on the cross rather than carrying it. But whoever the angel in robes was intended to represent, the memorial has long since been dubbed “Jesus in Cowboy Boots”. 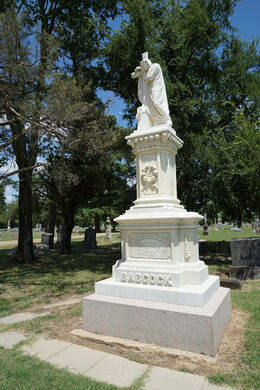 You can decide for yourself – the cemetery is on the south side of town, and Babcock’s grave will be easy to spot. There are other interesting graves to see at Evergreen (a reclining bison looks particularly at home), but tread lightly and quietly. The other 39,999 permanent residents are trying to get some rest. 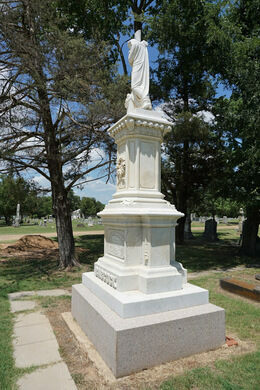 Evergreen Cemetery is on the south side of town, straight down S. Church St or 6th St. SE. Enter at 5th St. SE and the Babcock Memorial will be in the second block on your left. Evergreen asks that you please be respectful of your surroundings when visiting. In Paris, Texas they have their own Eiffel Tower, it just has a cowboy hat on it. The final resting place of Captain William Becknell, the Old West frontiersman who forged the Santa Fe Trail. No matter what the plaque under this massive legume says, this is not the world's largest peanut. Born a slave on the Arlington estate, Parks dug the first graves at Arlington National Cemetery, and was buried there, too. The final resting place of many of Germany's most famous communists.